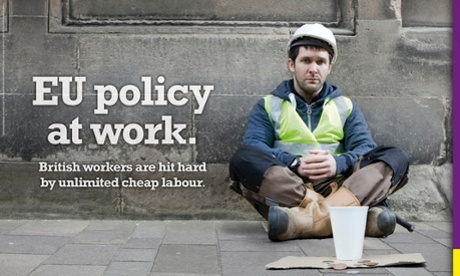 UKIP (aka the people’s army) have launched their campaign ahead of May’s European elections. The campaign attacks establishment thinking focusing on concerns of ordinary Brits. Who better to head up the campaign (funded by ex-Tory donor and millionaire Paul Sykes) than son of a stockbroker, the privately educated city boy, Mr Nigel Farage? Who says UKIP don’t have a sense of humour? UKIP’s European election campaign was today launched with a bang. Their (racist?) posters have caused controversy, shock and also a fair amount of TV coverage for UKIP. But there is more than just a touch of irony in this campaign. The posters nail the core issues that voters keep saying they are most worried about… the economy, immigration, and of course, jobs. But threaded throughout is their ‘core message’ that they are the party of the people standing up for ordinary Brits. With either a splendid sense of humour or a terrifying sense of self-delusion, UKIP have even started referring to themselves as ‘the people’s army’. You have to laugh don’t you (or you might cry)? Here is the privately educated stockbroker, Nigel Farage, heading up a campaign that is funded by ex-Tory millionaire Paul Sykes, lamenting the ‘establishment’ and ‘vested interests’. In a way it is all quite droll. Worryingly though, against all odds, I am not sure the electorate have spotted the joke. UKIP are not exactly shy about their vested own interests. Hynd’s Blog is no Private Eye. Just yesterday in that little known publication, The Daily Telegraph, millionaire Mr Sykes wrote quite openly about why he has pumped £1.5 million personal pounds into the latest UKIP poster campaign. In the article he finishes by chillingly saying he will ‘do whatever it takes’. Can people really not spot the contradiction here? A party stuffed full with disgraced Tories suddenly becoming the voice of the people? If I stopped looking at the polls I could be convinced that UKIP was just a rather droll joke, but then I am reminded that this is the party that many tip to win May’s elections. Hi I’m John, I really like your writing. The peoples army seems to me a bit controversial. Thanks.